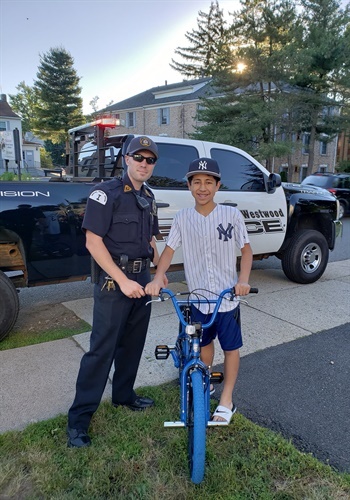 Officers from the Westwood (NJ) Police Department recently delivered a new bicycle to a 13-year-old boy who discovered one morning that his had been taken from his front porch. According to NorthJersey.com, when Ryan Sestanovich — a special police officer with the department — learned of the theft, he immediately remembered when he was 13 and the same thing happened to him. "He had souped-up his hand-me-down bike and it was a gut-punch when it was stolen out of his backyard," according to the newspaper. Sestanovich said. "I thought, if I'm in the position to reverse that feeling and give the kid a bike, I’m going to do my best to do that." Sestanovich began to network to have the bike replaced. A brand-new, blue Mongoose BMX bike was donated anonymously by a shop in town.